Submitted by mahoney on Tue, 04/08/2008 - 1:35pm. 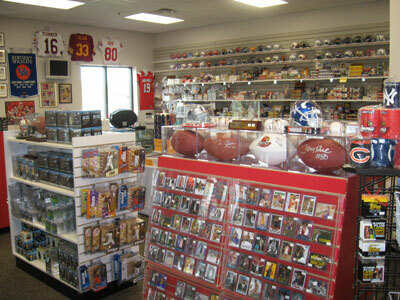 The above picture was taken at East End Sports Cards in Louisville, KY.
Sports Cards Stores throughout the USA including Hawaii...Sports card is a generic term for a trading card with a sports-related subject, as opposed to non-sports trading cards that deal with other topics. Sports cards were among the earliest, and remain one of the most popular, forms of collectibles. They typically consist of a picture of a player on one side, with statistics or other information on the reverse. The first stage in the development of sports cards, during the second half of the 19th century, is essentially the story of baseball cards, since baseball was the first sport to become widely professionalized. Hockey cards also began to appear early in the 20th century. Cards from this period are commonly known as cigarette cards or tobacco cards, because many were produced by tobacco companies and sold as inserts in packages of cigarettes as a gimmick. Cards have been produced featuring most major sports, especially those played in North America. Baseball cards remain the most widely collected form of sports card, although football, basketball, and hockey cards are also widely collected. Many older sports cards (pre-1980) command a high price today; this is because they are hard to find, especially in quality condition. This happened because many children used to place their cards in bicycle spokes, where the cards were easily damaged. Rookie cards of Hall of Fame sports stars can command thousands of dollars if they have been relatively well-preserved. In the 1980s, sports cards started to get produced in higher numbers, and collectors started to keep their cards in better condition as they became increasingly aware of their potential investment value. This trend continued well into the 1990s. Unfortunately, the proliferation of cards saturated the market, and by the late 1990s, card companies began to produce scarcer versions of cards to keep many collectors interested. The latest trends in the hobby have been "game used memorabilia" cards, which usually feature a piece of a player's jersey worn in a real professional game; other memorabilia cards include pieces of bats, balls, and floors. Authenticated autographs are also popular, as are "serially numbered" cards, which are produced in much fewer amounts than regular "base set cards".